Join the discussion on our forums! 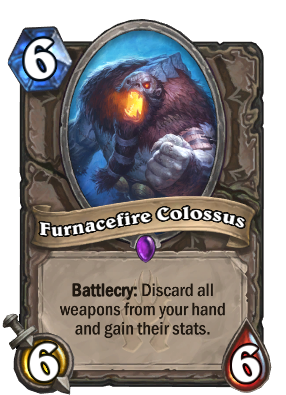 Come discuss Furnacefire Colossus over in our dedicated Furnacefire Colossus discussion topic. I finally saw this card played! I Shadow Word: Death'd it... but I finally saw it played! If Warlock had any weapons this guy would be pretty damn good in Discolock. Guaranteed to discard specific cards so it doesn't discard other valuable cards you don't want gone and it's an instant threat on the board with huge stats. Very cool design, but probably will never see play. ive got it 20/13 on turn 6 on my first try with no particular setup, just lucky. Probably bad but I still want to try and make an otk deck with it. Need to find a good way to give it charge. The only way to give a minion charge is in Warrior, and cards buffed that way can't attack heroes the turn they are played. It would be a 2 turn kill. Does this card synergize with tentacles for arms? Maybe in place of Bittertide Hydra in Pirate Warrior? I know you WANT your weapons, but I've definitely had hands clogged with them... and he's a nice sized threat with no face damaging downside. I like this one, mostly because of the art, but still, I like it. can't wait to see golden! Remember when we had to do the whole Thadius/Feugen combo to get an 11/11 Thadius? Now we can just play this + Arcanite on turn 6 for an 11/9. In other words, why does this have 9.5% dust it? Does everyone think you have to equip the weapon first? It's the "put all your eggs in one basket" card. You are going to feel really bad when this gets transformed/removed. Weapons are more valuable when played. With 2 Gorehowl in the deck, and getting 1 tick of Emperor Thaurissan on: 1 Charge, 1 Forge of Souls, 1 Furnacefire Colossus, 2 Rampage, and have 2 Inner Rage. Please, Pirate warrior needs Arcanite Reaper more than they need a bulky minion, especially in this new "frozen" archetype. not every warrior deck is a pirate warrior.